Durga Puja is celebrated in honour of the Mother Goddess (Durga), and her victory over the evil buffalo demon Mahishasura. The commemoration honours the dynamic female force (Shakti) in the Universe. Durga Puja in India is much beyond the charm and sparkle of pandals and is not just limited to revelries and indulging. The real reason for every devotee to perform Durga Pooja is the enlightenment of soul and the rejoicing of good over evil. 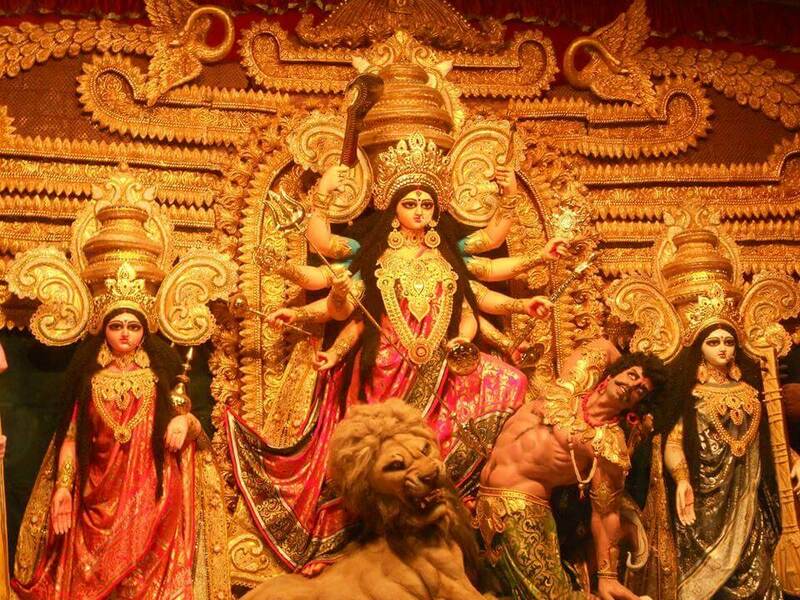 When is Durga Puja held? The Lunar Calendar is used to determine the dates of the festival. Hence, the dates change every year. Durga Puja is celebrated during the last five days of Navaratri and Dussehra. In 2015, Durga Puja will take place from 18th Oct to 22nd Oct, trailed by the glorious immersion of Durga idols on the 23rd of the month. If you wish to experience this festival in its most authentic form West Bengal is the best place to be. When BONGS from diverse parts of the world travel to reunite with their family and friends, flaring up the delighted mood; when you see the entire state dolled up in vibrant colours and sparkling lights you know that it’s Durga Puja time. Our West-Bengal holiday packages are sure to offer you an experience of a lifetime. Don’t forget to check out the Bagbazaar pandal in Northern Kolkata, College square pandal in Central Kolkata and the Suruchi Sangha pandal in South Kolkata. Hastakala – This is when renowned potters elaborately craft the idols. Mahalaya– This is when the goddess is invited to come to the earth. Chokkhu Daan-This auspicious occasion involves drawing the eyes on the idols. Kola Bau Bath– A sacramental ritual called ‘Kola Bau Bath’ is performed to suffuse the vigour of Ma Durga into the idol. This is achieved through a small banana plant called a Kola Bou (banana bride). Complemented by rhythmists and the reading of mantras by a Hindu priest, the Kola Bou is cleansed and purified in the holy river. It’s then draped up in a sari with a red border and carried, in a parade, back to the pandal. Pran Pratisthan- After the idol of Goddess Durga has been fixed in the pandal, a ritual is performed to summon her holy presence on the day of Saptami. Mahasaptami– This is the first day of Durga Puja. It involves worshipping 9 types of plants symbolizing the deity. Ashtami- On this day Goddess Durga is worshiped in the form of a virgin girl in a ritual called the Kumari Puja. Navami– On this day worship is concluded on Navami with a maha aarti (great fire ceremony), which marks the end of the important rituals and prayers. Dashami- On the last day, Durga returns to her husband’s abode and the statutes are taken for immersion. Food is an enormous part of the celebration, and you will find street stalls blossoming all over India (Especially Kolkata). 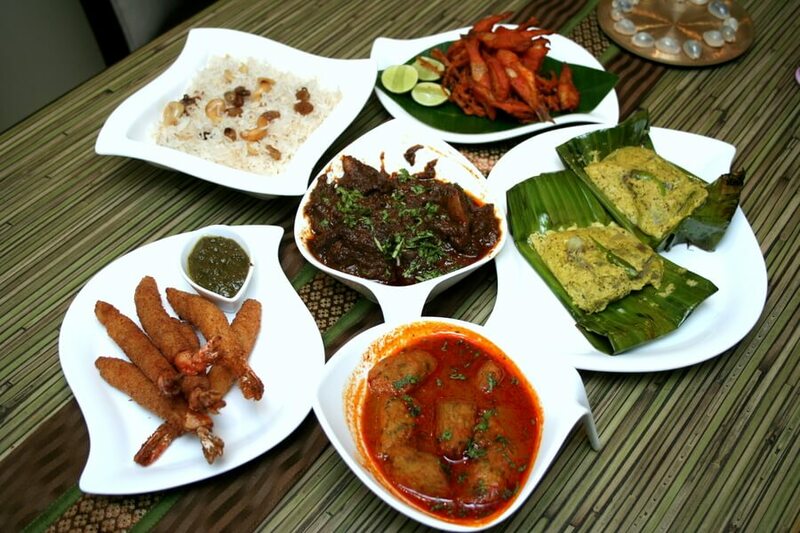 This festive period is a foodie’s paradise with plenty of mouth-watering dishes to savour like luchi, alu torkari, sandesh, tangra macher jhol, shukto, aloo potol posto, kolar bora and cholar dal. The Durga Puja festival is the most societal and dramatic event filled with dance performances dedicated in the name of the deity, mythological skits and different kind of cultural performances. Come enlighten, celebrate and enjoy! JOI MAA DURGA! Durga Puja is celebrated in honour of the Mother Goddess (Durga), and her victory over the evil buffalo demon Mahishasura.